Pozzolan’s rebar spacers ... used worldwide. A WELL-KNOWN brand among construction materials in the region, Pozzolan Construction Industries has recently established its office and manufacturing facility in the UAE. The company specialises in the production of plastic spacers for concrete covers and also supporting parts for reinforcement. Established in 1991 by Shahen Aghamal, Pozzolan Construction Industries has been serving the GCC market for more than eight years and having been involved in numerous projects through different distributors, the company felt the need to opening a manufacturing facility in the UAE in order to serve its clients better. In the UAE, the company operates as Pozzolan International. Pozzolan’s product range comprises more than 250 types of spacers and accessories, among which Stool, Eifel, Arc, and post-tension double rebar chair spacers are uniquely designed by the company. 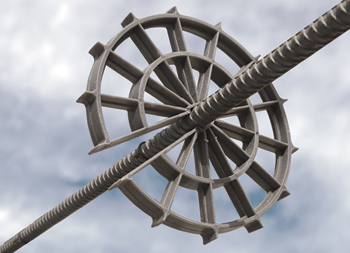 Other products include chair, and wheel spacers, anchor and nailing centralisers, formwork accessories, underground conduit cable spacers and also water-stop tapes. All the products have been assessed and deemed to comply with the requirements of CE, according to DIN 1045 relating to construction materials. The certificate is valid for manufacturing plastic spacers for reinforced concrete covers. As a holder of ISO 10002:2004 and ISO 9001:2008 certification from TQCS International (Group), the company guarantees the quality of its products. Pozzolan’s products have been sold to industry owners and the engineers in the UAE, Afghanistan, Andorra, Armenia, Iran, Iraq, Kuwait, Qatar, Oman, Saudi Arabia, Sri Lanka and Venezuela. Many of its customers are international leading construction companies such as Orascom Construction Industries, Tecnimont, Samsung Engineering, Arc Line and Borouge. Among its latest projects is the Abu Dhabi airport expansion, where its double rebar chair spacer has been used. Commenting on the application of Pozzolan products, Aghamal said: “The correct positioning of rebar in locations specified on the execution plans in reinforced concrete structures is of extreme importance in order to maintain the good quality and strength of reinforced concrete. “In many developed countries, especially in Europe, it has been known for a number of years that the thickness of the concrete cover guarantees the durability of the reinforced concrete structure, and is considered to be a major factor in preventing corrosion of the rebar. “Hence, since 1909 in Europe, with the collaboration of various manufacturers, the University of Essen, Specialised Institute of Precast Concrete units of Germany and Steel Reinforcement Institute have worked towards authorising the use of plastic spacers of various shapes, according to DIN 1045 standard specification”. Over the past two decades, Pozzolan has expanded its capabilities through extensive research, improving the quality of its products, promoting export to the Middle East, Far East, European and South American countries. It has now established a name as one of the most respectable manufacturers in the field of spacers and concrete accessory parts. Pozzolan’s reputation in the market is based on the trust of the clients and engineers and the company aims to continue to focus on ensuring customer satisfaction by offering better services and further innovations in the future.